Peter Greenham (1909-1992) was a distinguished figurative painter of portraits, landscapes and incidents from domestic life. His work was both sensitive and intelligent and like himself, without showiness or pretension. He was keeper of the Royal Academy Schools and a popular figure who taught many well-known artists including Martin Yeoman, Peter Kuhfeld, Edmund Fairfax-Lucy and Jane Corsellis. Greenham was born in Streatham and educated at Dulwich before studying English at Magdalen College, Oxford, followed by Fine Art at the Byam Shaw School of Art in Kensington from 1936-39 under the supervision of Ernest Jackson. After leaving Byam Shaw he became a schoolmaster at Magdalen College School, Oxford and was elected an Associate of the Royal Academy in 1951 and an R.A. in 1960. In 1964 he succeeded Sir Henry Rushbury as Keeper of the Royal Academy Schools, a position he held with distinction until his retirement in 1985. The Keeper has the responsibility of running the RA Schools and Greenham showed himself to have great sympathy and understanding for his students. In retirement he was able to concentrate entirely on his painting and tended to paint places he knew well such as the Norfolk coast, Northumberland, Oxfordshire and Annecy as well as his wife, the painter Jane Dowling and his children. Among the people he has painted are HRH Queen Elizabeth II, Sir Isaiah Berlin, Professor Leonie Gombrich, Lady Bonham Carter, Dr F R Leavis and Lord Hailsham. 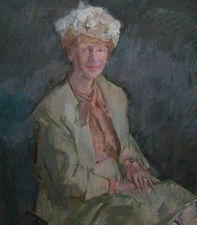 His portraits of 'Jane' and 'Father D'Arcy' and 'Life Class at Byam Shaw School' were bought under the terms of the Chantrey Bequest for the Tate Gallery. He is the author of book on Velasquez. Peter Greenham and Jane Dowling were given a retrospective touring exhibition under the sponsorship of the Arts Council and the Norwich School of Art from 1984-5 and Greenham had a Retrospective at the Ashmolean in 1989 to celebrate his 80th birthday.